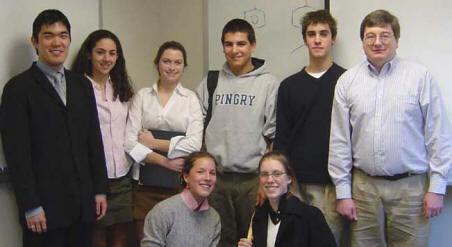 The 2003-04 Pingry SMART Team Students: (listed alphabetically by last name) Jonathan Bregman, Zack Cordero, Caitlin Jennings, Kelly Peeler, Ariana Lictenstein, Nick Molé, and Rachel VanWert. In process of converting into JMol tutorial. Not all scripts functional. 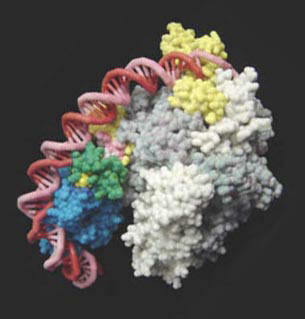 Photograph of model created using the ZCorp 3D printer. Yellow unit is the sigma factor responsible for promoter recognition. 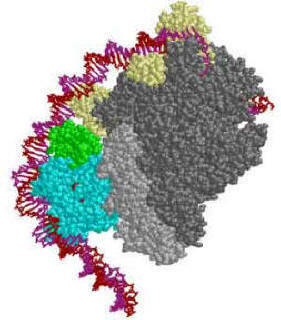 Blue is catabolite activator protein, or CAP, that is activated in absence of glucose (which induces production of cAMP) and is responsible for recruiting RNA polymerase to the promoter.